It seems as if June 8 will be a big launch for Android phones on T-Mobile. 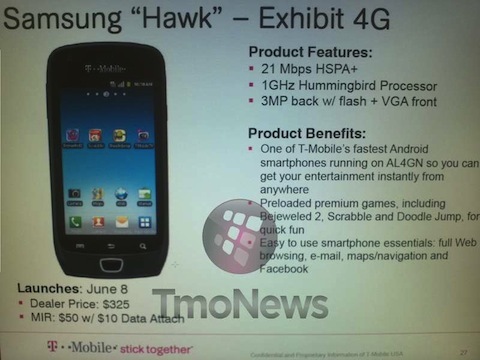 We reported earlier that T-Mobile was going to launch the HTC Sensations 4G on June 8, but a new leak points to the Samsung Exhibit 4G dropping on the same day. This will be T-Mobile’s third 21 Mbps HSPA+ capable device. The Samsung Exhibit 4G runs on Google’s Android OS with a 1GHz processor, 3-megapixel camera and a VGA front-facing camera.